The needs in our nation have been great recently! At the Men's Breakfast this Saturday Dr. Meek will give a brief devotion on why there is so much suffering and how seeking God will bring healing. 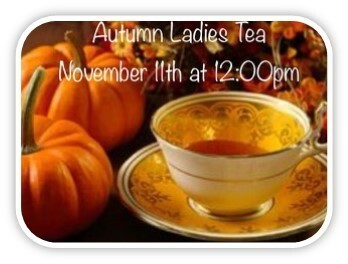 We'll have a wonderful time of prayer and a fantastic breakfast! Please bring as many men as you can this Saturday at 7:00 a.m.
At least 59 people were killed and 524 injured in a shooting on the Las Vegas Strip. As people were being slaughtered others were binding up the wounded, putting themselves in harm’s way. They were using their shirts and whatever else was available to serve their fellow humans. Now people are giving blood, not for Democrats or Republicans, not for Christians or Muslims but for people. It’s just people serving people. We need to serve others with what we’re given – whatever physical, material, mental and spiritual resources we have. This Sunday I’m preaching on “Serve with What You’re Given” about the parable of the talents in Matthew 25:14-30. Our word “talent” comes from this parable. “Talent” originally meant a weight of money – about 75 pounds. A master going on a journey entrusted his “talents” to his slaves. When he returned he expected a return on his money. Likewise, God expects us to serve him with what he’s entrusted to us. We don’t all have the same talents, spiritual gifts and material goods, but we’re expected to act boldly, creatively, faithfully and lovingly with what God has given us in order to add to his kingdom. Please come Sunday and learn to serve with what you’re given. Meanwhile, let’s pray for the people of Las Vegas, Texas, Louisiana, Florida, the Virgin Islands, Puerto Rico, the other Caribbean Islands and Mexico. Great tragedies have struck our world recently. Let’s offer ourselves in service through prayers, giving and deeds. We have also created an online sign-up for your convenience. A sign-up will be made available in the church lobby. 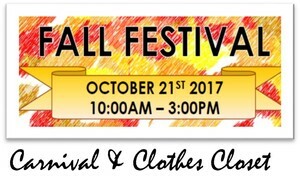 We are asking that everyone begin to pray for our upcoming Fall Festival. There is a prayer room on the left side of the worship center. You may go in there to pray before services, during the invitation time or after services. 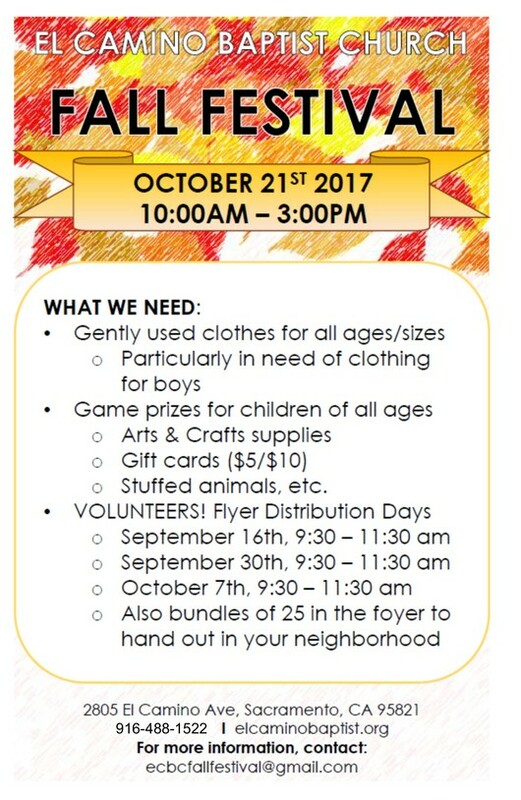 Please pray for our Fall Festival coming up in October. ►This week's prayer focus: Please pray for the physical, spiritual and mental endurance of our volunteers who’ve put in a multitude of hours to get ready for the Festival. The California Southern Baptist Convention Annual Meeting is scheduled for October 24 & 25, in Riverside, CA. El Camino will vote in messengers to the State Convention on Sunday, October 8th. The Sacramento Region Baptist Network Annual Meeting is scheduled for October 19th. More information to follow. El Camino will vote in messengers to Association Annual Meeting on Sunday, October 8th. This is a special invitation to preview I CAN ONLY IMAGINE which releases in theaters, March 16, 2018. Only limited seats are available for this small, private screening for pastors and ministry leaders.